Space Vector has manufactured and flown over 1500 cold gas components for a number of commercial and military customers. SVC has over 30 years experience in the design and development of cold gas system for launch vehicles, space shuttle launched satellite systems, and scientific experiments. Space Vector thruster valves come in 2 coil sizes with output force in the micro thrust range to 25 lbf. All thrusters can be packaged individually or in a cluster arrangement. The large thruster valve is available with a standard 1 amp coil (28 W) or a low resistance high response (HR) coil. The inlet flow can be easily altered to accommodate a wide range of inlet pressures. Both sizes come with a variety of nozzle configurations and throat diameters to optimize thruster performance. Space Vector manufactures both single and dual stage pressure regulators that are capable of accurately regulating within 5%. The output pressure is adjustable from 15 to 500 psi. The dual stage regulator has a switchable output with a pressure range ratio (high to low) of greater than 8 to 1. 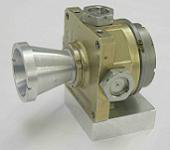 This feature allows a single thruster to be used in a high thrust mode for large maneuvers or accelerations and low thrust mode for fine pointing. The electrically switchable output can be commanded at any time from high to low or low to high. The Space Vector Isolation valves can be used with any system when long term storage is required or where remote fill capabilities do not exist. These single and dual squib isolation valves can be mounted anywhere downstream of the supply and are activated with 5 amps direct current per bridgewire. Electrical connector is MS3116-8-4S.